Location: East of Venore, =706&x=1282&z=7&zoom=1[[Image:Map_(Colour).gif|Map_(Colour).gifVenore. 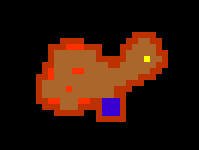 It is largely inhabited by Elf and Elf Scout, but there are stronger creatures like Dragon, Elf Arcanist at, Elf Sharpshooter, Elf Guardian and Elf Swordmaster at some portions(avoidable ones) of the fortress. The place is also famous for a very old mystery, regarding a corridor blocked by magic walls, which no one still knows how to pass through. 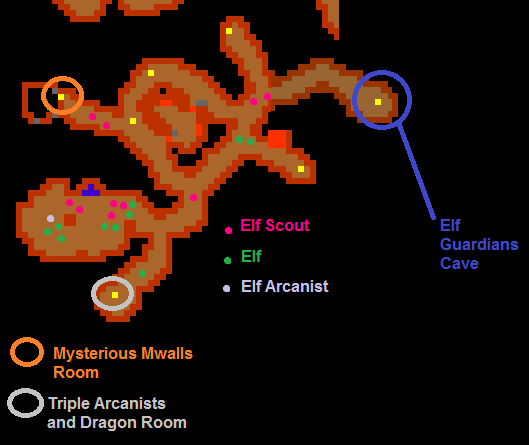 Tasks: This place is recommended for doing Elf Scout task and Elf Arcanist task. Loot: Yellow Gem, Elven Bow, Platinum Amulet, Spike Sword, Guardian Shield, Light Sword and Hunting Boware the loots with he highest value, while longsword, broad sword, two handed sword, bow, Elven Amulet and Life Crystal can be gathered for lootbags. There is a Royal Mailbox inside the fortress. Warriors: You can hunt here very early as a knight, but never forget to carry some Ultimate Healing Rune with you. The only thing you need to have in mind is to avoid getting focused by too many Elf Scout, so try to kill them fast. There might be some times where it is better to use Great Fireball runes to clear all the monsters instead of tanking all of them and killing one by one, so bring the runes. Also, if you want to kill the Elf Arcanist faster, Explosion are the only option. Cam: [https://www.dropbox.com/s/3m9is1f1mqfuigp/2014-4-18-18-14-57.cam?dl=0 Downloadarrowand Hunting Arrow here, it is advisable to use a bowinstead of a crossbow, and in addition to that, all elves, except for the arcanists, can be affected by any of the 3 Distance Weapons. For your safety, bring Ultimate Healing Rune and also Great Fireball to avoid waste. Spears are also a good alternative. Stair hopping is effective against Elf Swordmaster. Cam: [https://www.dropbox.com/s/8v0bd04w188ssli/new%20elves%20triple%20bow.cam?dl=0 DownloadElf Scout, Elf Sharpshooter, Elf Guardian, Elf Swordmaster and Elf Arcanist are all immune to Invisible. GFB runes can be an option to hunt all elves but the arcanists, you will need explosions for them. *For all classes: Elf Swordmaster run away when on low HP and have no healing, so you can just leaving them that way, instead of killing, it is a great alternative to avoid waste. Starting from the Venore south gate, =719&x=1128&z=6&zoom=1 machete to cut the jungle grass and you walk a little more to find the entrance to Shadowthorn. This Area is crowded with elves and elf scouts. 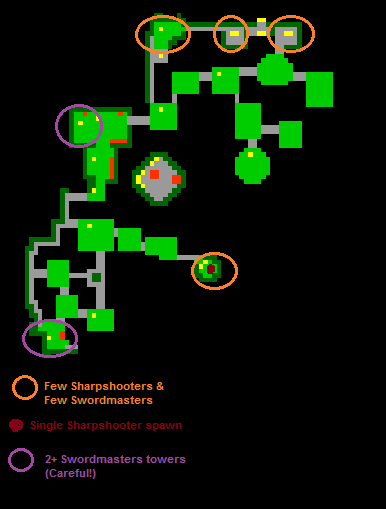 In the towers, as shown by the map above, Elf Sharpshooter and Elf Swordmaster can be encountered, the middle tower, next to the Arcanist Tower, is the most dangerous of all, there are 3 Elf Swordmaster+ an Elf Sharpshooterin the last floor. Also beware of the single sharpshooter spawn at +1 if you are low level. 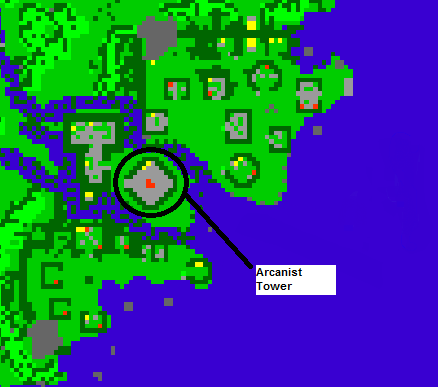 In the west there will be 4 elf and 2 elf scout, to east (Arcanist Tower) there will be 2 elfand 1 elf scout. Going up the ladders of the room in the left side, you meet more of them, again, some elves with scouts. elf scout and 1 Elfhere. elf scout and 1 elf arcanist, they tend to spread between the small rooms, so Great Fireball are not very effective here. It is usually better to kill the arcanist first. dragon in each of the 2 small rooms, the player can't reach them from here, the acces for the ramps is one level above. elf scout and 3 elf arcanist here. Great Fireball are a good option since even with good equipment and skills you will take too much damage if you try to kill 1 by 1. Two ramps in the middle will grant access to the dragons below. 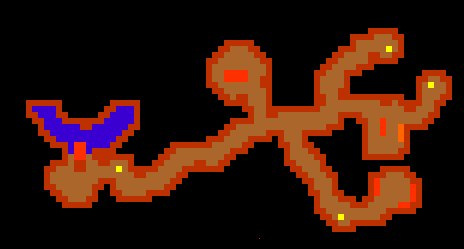 Like before, there will be only elf and elf scout here, the ladder to the west will take you the middle island and the east ladder will take you to the second floor. cyclopstogether with an elf scout in this small room, nothing else important here. Demon Skeleton, 4 Elf Arcanist, 6 Elf Scout and 2 Ghoul. Be prepared. 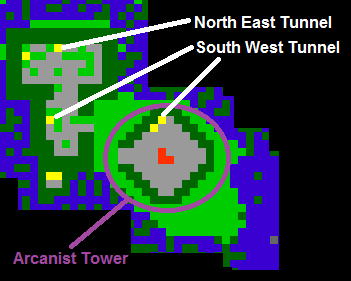 To west you will see there is a smaller room block by a few Magic Walls, it is also possible to see a chest in the other side. It is not known how to get through the walls, or if there is even a way to do it. ropeor Magic Rope to go back! This page was last edited on 7 March 2019, at 17:18.